Looking as if there are a great many more miles left in her, 25001 waits at Swindon Works for the end, which, along with 25013/19/21 have just arrived from Scotland (October 26th, 1980). The left hand side of 25001 exhibits the standard two rows of four air filters (see below for the opposite side). A TOPS report for October 28th 1980 reveals 25001 has no 'A' hours left, but has 115 hours to run until its next 'C' exam. The report also indicates that 25001 was 'turned off' during the evening of September 25th 1980. The nineteen year five month career of D5151/25001 was spent allocated to depots on both sides of the Pennines and north of the border (ER, LMR & ScR). Time between last Classified repair and withdrawal: 34 months. September 1967 to Gateshead (52A). 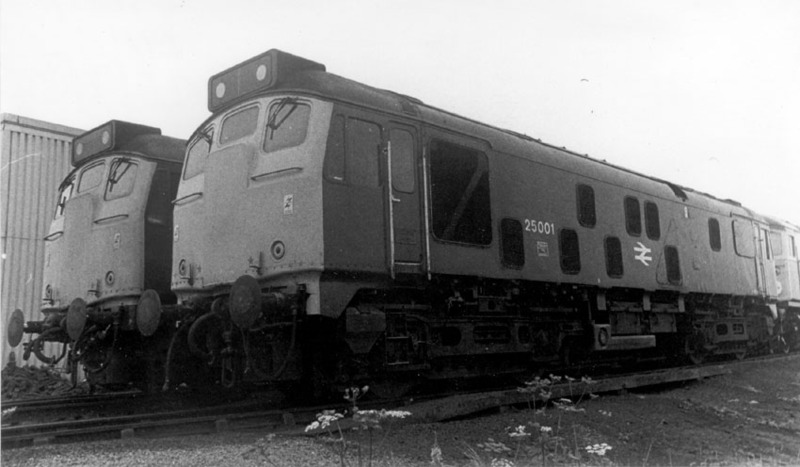 25001 was the 42nd Class 25 withdrawn, one of nine retired during September 1980. After withdrawal 25001 was moved with 25013/19/21, being noted at Durham behind 40006 on October 10th. Ironically an overnight stop was made at Thornaby - 25001's first home. Here withdrawn 31274 was added to the consist, which left on 16th, it is believed with 25001 towing the consist! (as the 07.20 York - Swindon). By October 19th they had been received at Swindon Works. 25001 was broken up by the first week of December 1980. Noted Darlington Works June 1963. Noted Glasgow Works November 1977 (included repaint). 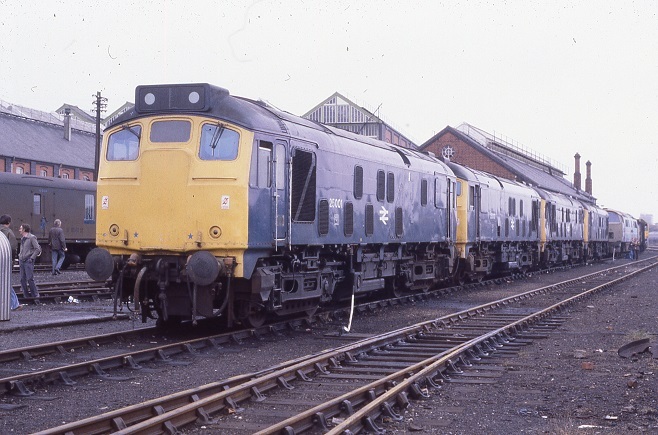 With production closing out on Darlington's last batch of Class 24s (up to D5113) more frames were laid during January for a further twenty five machines (D5151 - D5175), which externally would be very similar to the final batch of Class 24s. 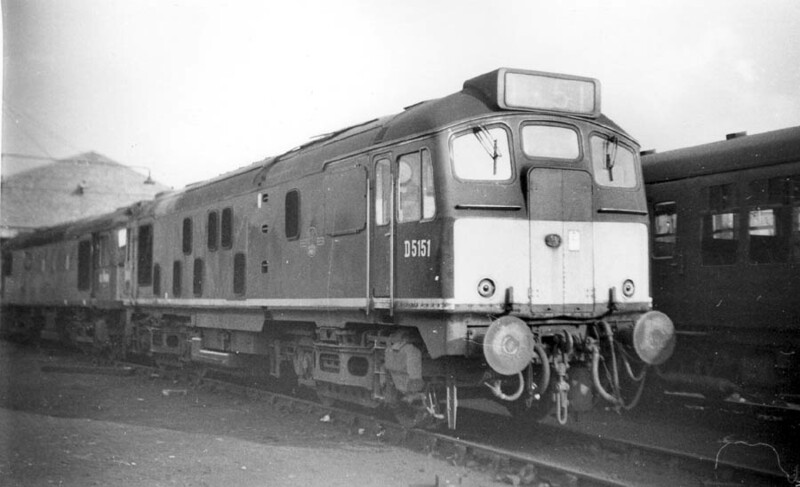 D5151 was the first of the Type 2s built with the newer 1,250hp "B" engine, modified generator assembly and traction motors. This increase in horsepower was obtained from an air/water free flow intercooler fitted between a higher capacity pressure charger and inlet manifold, included within the normal cooling circuit to maintain simplicity. The cylinder head was also modified and strengthened. The BTH generator was now rated as 735kW, 750/545V, 1090/1500A at 750 rpm, only slightly different from the earlier Class 24s. The traction motors were rated at 245hp, 545V, 375A at 560 rpm with a gear ratio of 18:79. Maximum tractive effort was 39,000lb whilst continuous t.e. was 20,800lb at 17.1mph, the latter standard for all Class 25s. Horsepower at the rail was 949, now available between 9.3 and 77.6 mph, with maximum speed increased to 90mph. 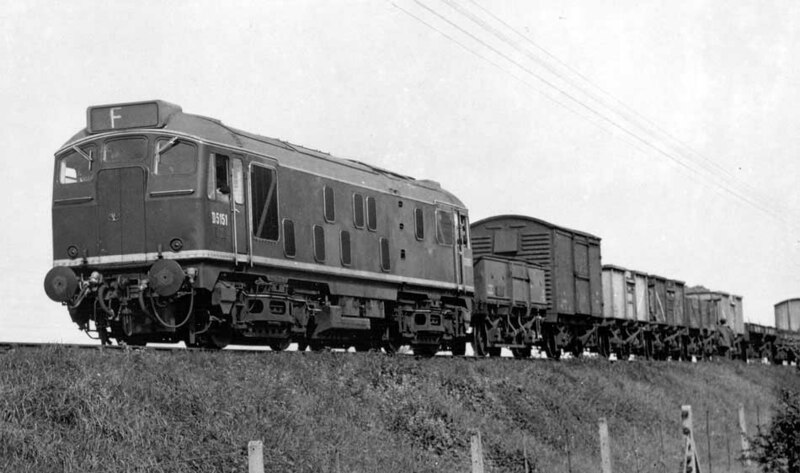 The fuel capacity of the first fifteen remained at 520 gallons, locomotive weight was 70.25 tons, whilst the final ten had larger 620 gallon fuel tanks, with a weight of 72.35 tons. 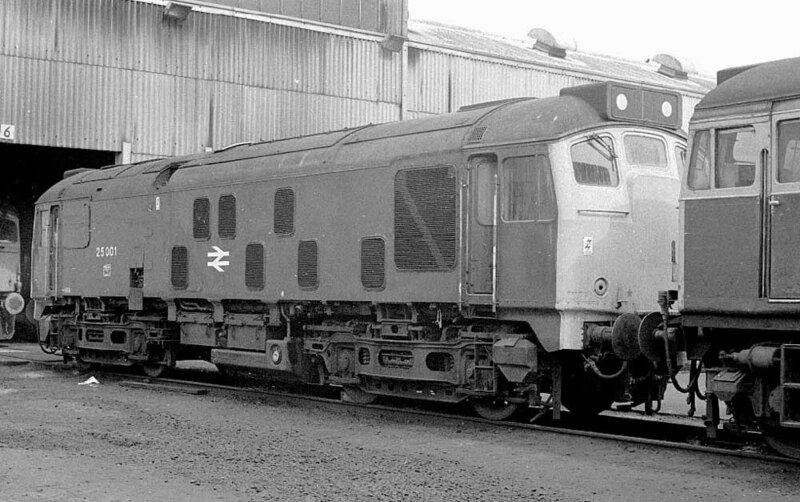 D5151 - D5175 utilized the Class 24/1 bodyshell, cabs and paint scheme, and like the Class 45s the side grilles were highlighted in grey. As they had been ordered for working freight traffic in the Teeside area this batch of locomotives were not equipped with steam heating equipment. D5151 was delivered on April 15th to BR's first purpose built diesel depot at Thornaby (51L), with the intention to assist in the eradication of steam working in the Tees area. This new depot replaced Newport (51B) and Middlesborough (51D), having cost GBP 1¼ million, opening to steam during June 1958 on a seventy acre site, it comprised an octagonal roundhouse, the last built by BR and a through shed, suitable for use by the newly arriving diesels. It would close to steam on December 14th 1964. Trial running of D5151 was with a rake of redundant LNER coaches, normal duties would comprise freight workings in the Teeside area. Photograph collection of webmaster. A fine view of D5151 not too long out of Darlington, all that seems to have been added is the 51L worksplate on the cabfront. By at least June 1962 a yellow warning panel had been added to the cab fronts and an electrification flash now positioned next to the shed plate. During June D5151 was noted passing through the closed Norton station with an excursion train to Seaton Carew. Noted Darlington Works during August. Photograph collection of webmaster. 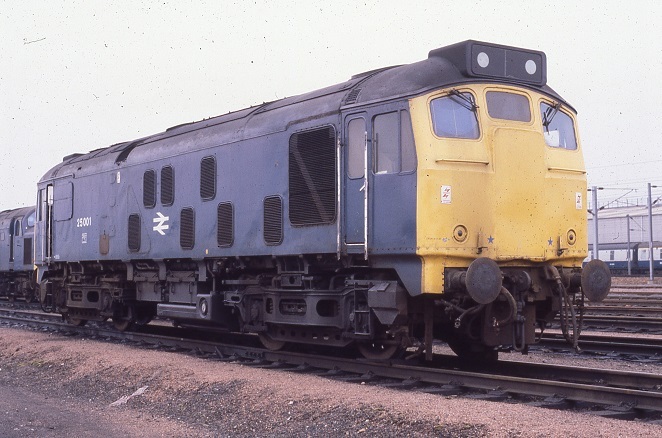 A work stained D5151 keeps company with another Class 25, possibly at Thornaby, date unknown. Noted Darlington Works during June. Noted Derby Works during September. Condition year/month uncertain: green livery with small yellow warning panels, curved upper corners, no frame level stripe on cabfront, warning panel does not reach bottom of frame, blanking plates fitted, hand/footholds present, engine exhaust in original position above boiler room, ridge sided sandboxes, three rung bogie mounted footsteps, steam style shedplate on cab front, fuel tank has no circular gauge fitted. Noted Derby Works during July, in September 25001 moved to Gateshead (52A), which included trips on the Consett branch and across the Pennines to Carlisle (12A), which would be it's new home from December. In January 5151 - 5156 moved to Springs Branch (8F) followed by a move in May 1968 to Longsight (9A). Condition September: blue/yellow livery, gangway doors present, blanking plates fitted, hand/footholds present, fuel tank equipped with circular gauge, ridge sided sandboxes, three-rung bogie mounted footsteps, exhaust located above engine room, one emblem on each cabside, two numbers on each bodyside. During September 5155 & 5156 moved from Longsight to Eastfield (65A) whilst the following month 5151 - 5154 moved to Haymarket (64B) to assist the Scottish Region in clearing out its few remaining Class 17/21/29's. Noted Glasgow Works during August. On August 23rd the 19.20 York - Birmingham New Street was worked by 25001 & 25012. The 08.12 Derby - Yarmouth to Norwich and the return 14.56 Norwich - Derby were worked by 25001 & 25136 on September 28th. On June 28th the 07.18 Sheffield - Skegness and the return 10.55 Skegness - Sheffield were worked by 25001. During July 25001 was transferred from Tinsley to Eastfield, on July 14th the Perth - Edinburgh portion of the 16.35 Inverness - Glasgow was worked by 25001 & 26017. With all the Class 24s retired and a continuing surplus of Type 2s, the Class 25/0s became the next fodder for the scrapman. The first withdrawal for the sub group came in December 1975, however 25001 soldiered on at Eastfield for just under five more years. On March 14th 25001 was noted at Newport, Ebbw Junction depot. On February 7th whilst working a Glasgow - Fort William freight train 25001 was required to assist 20120 which had failed on its train at Kirkpatrick, the Class 25 being used to push the failure into the loop. On February 26th 25001 was noted at Ayr shed. 25001 stands at Ayr on June 25th 1977. The locomotive still carries its number on the cab side (in true Derby style), but the blue star multiple unit coupling symbols are in the Glasgow style (inboard of the marker lights). Works attention in November would soon correct this anomaly. Other changes are the sheeting over of the gangway doors and the disappearance of the steam style shedplate. Also removed is the frame level valencing between the cabs. 25001 was noted at Carlisle on August 1st with a parcels train. 25001 was noted at Ayr depot on August 9th. 25001 was noted in Glasgow Works early in November. 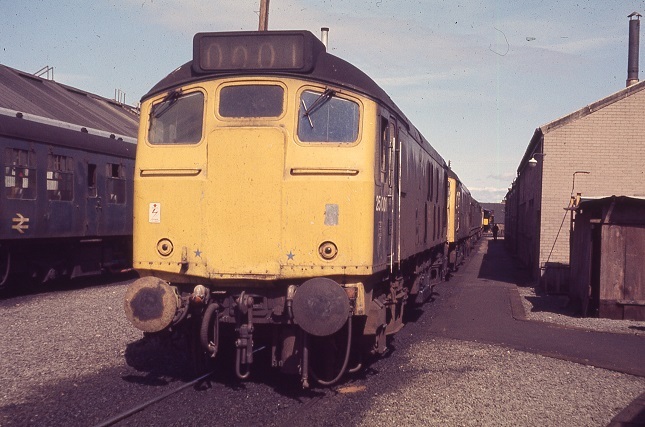 25001 stands at Polmadie on March 15th 1980, six months prior to withdrawal. This view of the right side of the locomotive reveals the two rows of air filters, three on top, four below. In contrast to the view at Ayr (above), the locomotive has been through Glasgow Works, getting a repaint, including the re-positioning of the numbers and data panel away from the cabside to a more centered position on the bodyside. And at some point the fuel tank has been fitted with a large circular fuel gauge. During the first week of August 25001 acquired some passenger mileage, on August 1st the 08.44 Glasgow Queen Street - Dundee was worked by 25001. Two days later (3rd) it was noted on the same route with an unidentified working. On August 6th 25001 worked the 12.50 Edinburgh - Perth. On September 23rd 25001 was noted at Inverness. Photograph courtesy A Forster. Motherwell, 11.15am on February 2nd 1979, 25001 keeps company with a snow plough and a Class 06. On June 9th the 13.40 Glasgow Central - Carlisle was worked by 25001. On March 20th Carlisle sent 25001 out on the 12.20 Carlisle - Severn Tunnel Junction freight. It failed at Kirkby Stephen, 40140 came to the rescue and dragged the train to ?? After repair it was diagrammed for the 21.45 Warrington - Llandudno Junction freight, but failed at Frodsham and was taken forward to Chester by 25130. 25001 left the area on March 27th with 25041 on the 06.05 Winsford - Millerhill rock salt. The first two weeks of April found 25001 stopped at Eastfield depot for an examination and body repairs. Photograph courtesy Tony Sayer Its now April 13th 1980 and 25001 is seen at its home depot, Eastfield. 25001 was noted at Eastfield depot on June 14th. Photograph courtesy A Forster. Its 13.30 on July 26th 1980, 25001 again at Millerhill. On July 25th the 17.12 Aberdeen - Stonehaven was worked by 25001. 25001 was stopped at Eastfield depot on August 15th for wheel turning, two days later it was noted at Glasgow Shields Road depot where the wheel turning was completed (?). On September 17th the 1T14 07.40 Aberdeen - Glasgow failed at Cadder Yard behind 40060, 25001 assisted the train on to Glasgow Queen Street. 25001 was withdrawn on the evening of September 25th 1980. Page added January 15th 2001. Last update June 1st 2018.